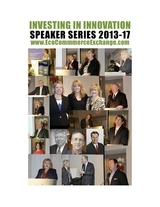 The 2015-18 Speaker Series in association with Eco Commerce Exchange (ECE) is now in production. From live events and select local venues, to an on-line presence that enables the worlds of social media and live performance to seamlessly meet, the ECE experience is about collaborative learning, discovering new business opportunities and unique contacts.The ECE is always open and just waiting to be discovered. New microbial biotechnology solutions can make low cost bio-refining possible and profitable. Today, most refineraries concentrate on extracting biogas to produce electricity in a highly unprofitable way, or to process and convert the gas to biomethane for use as a fuel. Most of the potential in the biomass remains unused with the additional problem of how to dispose of the waste. Our working group is able to provide 'game changing' technologies in bio-refining to solve this problem. Essentially all of the biomass is converted to usable products. We see a substantial growth of bio-refining within the next few years. This is something that simply has to be done, and we have bio-refining technology for it. By bio-refining we mean a process by which many separate product lines are produced from biological masses, e.g. cattle sludge, by means of advanced microbial biotechnology, before they are returned into the nature. Our solution turns the biological waste into raw-material, produces several lines of chemicals and fuels and separates the remaining mass into purified water and solid mass, which can be used, for instance in landscaping. Every product can be sold separately. The end-products of our bio-refining process include gas and liquid fuels, such as ethanol, butanol and biometane, raw materials of chemical and fertilizer industry, such as asetone, ammonium, phosphor and nitrogen, as well as raw materials of plastics industry, such as butanediol. Our method is truly unique in the world. The use of our patented microbial biotechnology makes low cost bio-refining possible. We can build a small, mobile refinery for test use and demonstration, or a full scale refinery to transfer this new-technology and make it available to global customers.